"Meanwhile, you only have to look at the financial collapse and sweeping emergency cuts at one of our neighbouring councils for an example of what we've averted through our rigorous financial management and commitment to saving services. The funding crisis for councils gets deeper and deeper, however. Today's announcement is further confirmation that despite what the Prime Minister has claimed, austerity is most definitely not over for local services." 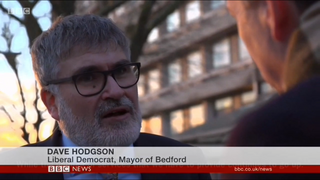 Mayor Dave appeared on both the BBC's 6pm and 10pm national news programmes following the funding announcement for all councils, and you can watch it on his Facebook page here.